Look back over this year's Inktober challenge with this list of 10 outstanding artists. Another October is nearly at an end, and that means another Inktober challenge will be drawing to a close. Aimed at giving artists all over the world creative prompts spread over 31 days, Inktober has grown into a popular online event since it was created back in 2009 by Jake Parker. And thanks to social media it's easier than ever to discover amazingly talented creative people who have taken part, including these 10 impressive artists. What could be cooler than simians in space? Swinging through a zero gravity corridor in a bulky life support suit, this space monkey gives you an idea of the imaginative and fantastical work self-taught illustrator Karl Kopinski has been producing over October. It's not even just the amazingly intricate line work that's impressed us, we're also bowled over by how Kopinski can create believable backgrounds with just a couple of lines. Fuelled by gallons of coffee and a lot of pizza, Jeff Stokely is a writer and artist whose Inktober output has been sporadic but impressive. His work tends to blend the fantastical with the everyday, as can be seen in images where beasts urge Stokely to tell their story. Graphic design and illustration graduate Mindy Lee adds a splash of colour to the Inktober challenge. Her drawings all convey a sense of movement and scale, and her use of colour is carefully chosen to bring every scene to life. Whether it's sorrow at the circus or a roller derby collision, Lee's illustrations are always well composed. On top of that, her consistent work approach means that there is an image for every day of the challenge. Making the most of October's other big event, Laurie A. Conley's Inktober illustrations sometimes portray spooky scenes. There's nothing to worry about though, as Conley's work also has a cute edge. 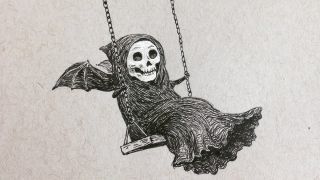 Whether it's a little grim reaper on a swing or a ghoul going trick or treating, her distinctive style can lend some charm to even the most macabre situation. Illustrator Samrath Kaur also packs a creepy element into this year's Inktober images, although you have to look a little harder to find it. What might look like an ordinary life drawing study might have creepy crawlies lurking in a shoe, while characters transport jars that appear to contain eyeballs. Having said that, sometimes Kaur has just created images of cool skateboarding kids leaving their elders in the dust. Visual development artist and character designer Bertrand Todesco demonstrates an impressive command of colour in his Inktober images, often livening up his pictures with a eye-catching shade. It's never over the top though, as his drawings of the Stranger Things kids, Wayne's World scenes, and Steven Universe characters reveal. We think comic creator and illustrator Jordyn Bochon might have a soft spot for the supernatural. Her work over the month regularly features witches, demons and spirits, all rendered in beautifully layered inks that come together with a sophisticated eye for colour. British concept artist Trudi Castle works as a storyboard artist, and this combination of imagery and plot is plain to see in her Inktober2016 illustrations. Lots of her drawings are split into panels that tell mini stories populated by cute and surreal characters. If you want to see mechs fight food-themed magicians, look no further. Known online as Koyamori, Maruti Bitamin is a prolific illustrator from China who now lives in Toronto. Her Inktober pictures tap into the popular supernatural theme, with plenty of witches and ghosts ready to keep you entertained. However her images are also filled with quirky, imaginative characters that you won't find anywhere else. Cory Loftis is a visual development artist at Walt Disney Studios, which may explain why his Inktober output has been less than regular. However the few images he has uploaded this year show off his fluid illustration style and keen eye for characterisation.